Everybody loves hydrangeas. After the cacophony of spring has passed and all the rhodies and azaleas are out of bloom, hydrangeas pick up the baton and continue with the parade of color in our gardens. They come in blues, purples, reds, pinks, and even white. They can be large “mop heads” or delicate “lace caps.” There are varieties that grow best in sun and others that prefer shade; there are even a few vining varieties that will clamber up a wall or tree trunk. I have over 12 different varieties in my garden alone. I am happy to report that those two issues have been solved with the introduction of the Endless Summer series by Bailey Nurseries and the Seaside Serenade Series by Monrovia Growers. Here’s all the information you need to know about these wonderful new introductions. Traditionally, most big leafed hydrangeas bloom only on last year’s wood - so if the plant is either pruned to severely in the winter or Mother Nature freezes it to the ground; there will be no blooms for the coming season. About 14 years ago in a production nursery in Minnesota, a hydrangea was discovered that was blooming on both last year’s wood and current season’s wood. Thus, the marketing brand of Endless Summer hydrangeas was born. You have probably seen them everywhere that plants are sold. 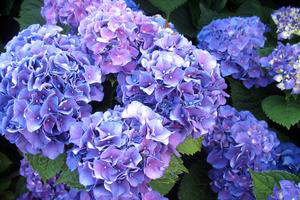 They come in a blue pot about the same color as the flowers and make a fantastic garden plant. Since the introduction of the Original Endless Summer, three more versions have found their way to the market and a 4th is due out in the spring of 2019 (although I am hoping to snag one this fall). If you go to their website you can learn all about them, just be careful you don’t start drooling all over your keyboard. The other common complaint about hydrangeas concerns their ultimate size. Most of the older varieties topped out at five to six feet tall by just as wide and if you had to chop them back to fit into a space, then you lost the blooms. The 2019 introduction “Summer Crush” from the Endless Summer brand will grow only 18 to 36 inches tall, so it will fit nicely into a lot of our smaller yards. And like all of the varieties in this series, it will bloom all summer. The other new series of hydrangeas, that are absolutely drop dead gorgeous, are from Monrovia Growers and are called the Seaside Serenade Series. These incredible plants sport dark bronze new foliage and the flowers are bicolor so they really stand out in the garden. The names are all east coast, like Bar Harbor, Hamptons, and Cape Cod - which is a bit of a put-off for us Northwesterners but what the heck, the plants are fabulous so I guess we can overlook a silly little name. Be sure you check out Fire Island with its ruffled flowers that are white and edged with red; they are amazing to say the least. All of the Seaside Serenade series appear to stay in the three to four foot range so again, they will fit well into our smaller gardens. For further research check out the Monrovia website. Probably 85% of all the hydrangeas that are on the market now are of the re-blooming habit (it will say that on the plant tag) and most of them will stay in the three foot range, so gardeners have lots of options. In fact, you may find your head spinning in the garden center where you can be looking at as many as 30 to 40 different choices. July is high blooming season for hydrangeas, so it’s a perfect time to make your summer visit back to the nursery. You will see lots of plants besides hydrangeas that simply were not there back in April and May. As for growing big leaf hydrangeas, it’s pretty easy. They look their best in morning sun with afternoon shade and prefer a consistently moist soil. Those big leaves will wilt rapidly if they get too dry. Too much shade, like on the north side, can sometimes result in “leggy” plants that bloom sparingly if at all. Cutting out a third of the old growth every year will keep them looking healthy and tidy. Finally, if you want to manipulate the colors from pink to blue (and everything in between) you can add potassium nitrate for pink or aluminum sulfate for blue. Both of these chemicals can be found at your local garden center. So, no more whining please about hydrangeas that don’t bloom or get too big. You now have lots of options to choose from. Sunnyside will be hosting two free classes – “Summer Pruning” on Saturday, July 7, 2018, at 10:00 am and again on Sunday, July 8th, at 11:00 am.